Last night I made my favorite summer salad, Ina Garten's Roasted Shrimp and Orzo. I have made this so many times that I could make it without even looking at the recipe. 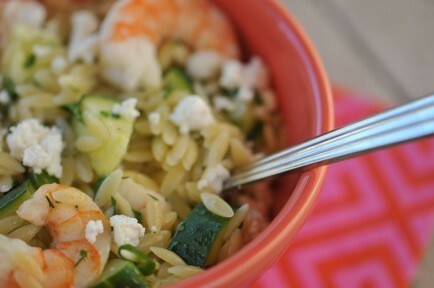 It's full of the most perfectly cooked oven-roasted shrimp, gorgeous fresh vegetables and creamy feta cheese. I have made it for parties, family gatherings and even just for myself. I'm telling you, it is so good! Have you ever made it?